Central defender Wayne Buchanan firmly believes Ashington can avoid being dragged any further into a relegation dogfight. 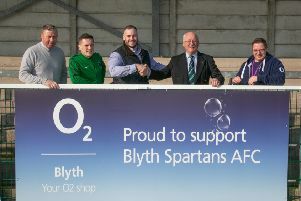 The ex-Blyth Spartans skipper made his debut for the Colliers in Saturday’s 5-2 defeat against Billingham Synthonia on Teesside. But even after his first outing with his new club, Buchanan remains upbeat and ultra confident that the Wansbeck side can pull themselves out of trouble. “It was a poor performance on Saturday,” he said. “There is an urgency to get matters sorted and the lads know that after six defeats in seven outings we are going to have to knuckle down on the pitch to get out of the rut, whilst we also need to lift the team spirit and get a better togetherness. “The players are aware the situation is not good enough and are determined to do everything they can to put things right, get back on track and to start a run going. “I have experienced this situation in my career before, which is not pleasant, but I know we have enough to get out of it if we stick together as a team. “Going forward we have potential, but we need to work harder and do more when we haven’t got the ball. “You can have all the ability in the world but without work rate then you are going nowhere. “The lads at Ashington are honest enough to know that and are ready for the battle which lies ahead.